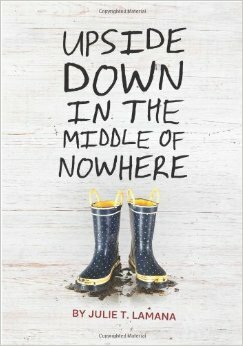 Upside Down in the Middle of Nowhere by Julie T. Lamana. Chronicle Books, 2014. Currently available. Face Value: The simple cover is almost whimsical. Looking at the muddy boots made me think this was a story about playing outside, getting a little messy, and having a good time. But it goes so much further than that. Once you have read the book, you will see just how heartbreaking this cover image is. In a way, it reflects the trajectory of the story. Everything seems so normal, and then it all shatters. Does it break the slate? Armani takes on responsibility in a time of extreme duress. Just days ago she was a happy-go-lucky nine year old, and then she suddenly becomes the head of her family unit. Armani is a Slatebreaker because she becomes fearless when she has to be and faces down anything that threatens the safety of her family. The book is full of strong women who endure unbelievable loss with grace. Who would we give it to? Readers like Jewell Parker Rhodes’ books or enjoy stories based in New Orleans will appreciate the sense of place that Lamana weaves into this story. This isn’t exactly a feel-good book, but it does have moments of beauty among all of the loss. Review: Armani is on the verge of her tenth birthday, and that is all that she can think about. Her whole world revolves around her birthday plans. It’s only natural for a nine-turning-ten-year-old to be focused on her birthday, so Armani gets pretty cranky when the adults seem distracted from her big celebration weekend. The storm brewing has the adults in a worried state. Armani can’t believe that they would allow this minor disturbance to detract from her very important weekend. As the weekend goes on, however, it becomes clear that this storm “Katrina” will be much more than a minor disturbance. By the time the Curtis family realizes the extent of the danger, it is too late to evacuate. They draw on their family’s greatest strength – their togetherness – and decide to wait it out as a team. Unfortunately, even though their family has plenty of love and support to go around, that is no match for the horrifying storm that descends upon New Orleans. Lamana’s narrative takes us through the horrifying experience of being inside a treasured family home as it is destroyed. Since it is all told from Armani’s young perspective, it is even more frightening, because Armani doesn’t fully understand how or why this is happening to her family. Tragedy after tragedy strikes, and Armani has to very quickly go from a self-focused girl to a young woman who is responsible for keeping her family together while surrounded by chaos. The most powerful moments of the story come after the storm, when Armani and her sisters wind up in a recovery station for the people whose homes were destroyed. Lamana writes the young survivors in a way that showcases the resilience of youth. These young people have lost their homes, and in some cases their parents. Yet they step up and care for their siblings. They band together with other children to make sure that everyone has a support system. Armani develops a prickly, defensive exterior. It isn’t always effective, but her fierce protectiveness manages to keep the family together despite the dangers of the situation. What struck me most about Upside Down in the Middle of Nowhere was the pace of the story. Most of the book (if we’re talking about quantity of pages/words) was spent describing Armani’s life and family before the storm. Lamana established a sense of the normality of life for a child of New Orleans before the storm. This was incredibly effective, because as the storm suddenly slammed into Armani’s life, the reader gets a sense of just how unexpected and disastrous Hurricane Katrina was for the residents of New Orleans. This book tells a powerful story of how children and families grow and change when faced with desolate circumstances. This entry was posted in Middle Grade, Reviews and tagged Disasters, Family, Hurricane Katrina, New Orleans, recovery. Bookmark the permalink.